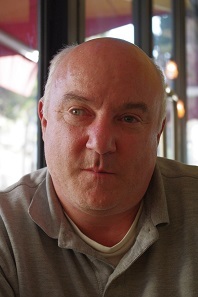 Yigal Arkin, winner of the 2018 Shekel Prize. Photo: Howard Berlin. 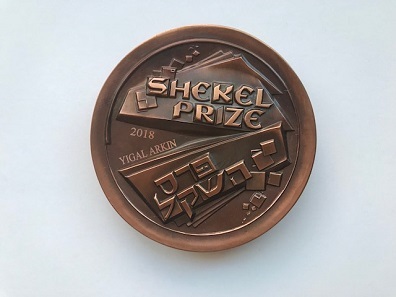 Shekel Prize Medal, designed by Victor Huster. Photo: Mel Wacks. The other nominees were “Israel Numismatic Research” published by the Israel Numismatic Society, “The Coinage of the First Jewish Revolt against Rome” by Robert Deutsch, and Interpreting Ancient Jewish coin Symbols by Dr. Gary Fine. The judges were Mel Wacks (chair), David Hendin, Ira Rezak, Allen Berman and Simcha Kuritzky. For information on ordering Money Time, contact the publisher Isranumis Coins & Paper Money Ltd. 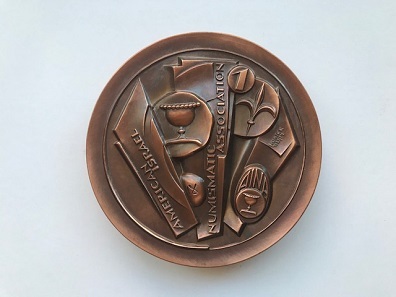 The Shekel Prize is awarded annually by the American Israel Numismatic Association.